Captain Kyle Pitts was born and raised in Panama City, Florida and has spent his entire life there. As a child, he began fishing with his father and uncle, learning the ebb and flow of his local waters. At age thirteen, he started spending his summers working on his uncle’s charter boat, earning the respect of the local fishing community and paving the way for his future as a fishing guide. Kyle still sticks to what he learned, “fishing is all about having fun and being on the water”. You can find Capt. Kyle floating around in the tower of his 22ft Blazer Bay looking for Jacks and Cobia, or in his 18ft Waterman, stalking tailing redfish or staked out for tarpon. When Kyle isn’t guiding, he enjoys spending time with his wife Leah, and passing down his fishing heritage to his daughter Alexis. Born in the rural South, Captain Jason Stacy grew up in a family of sportsmen, where his passion for the outdoors began. He draws upon a lifetime spent on the water to share his love and appreciation for the outdoors. He began guiding and teaching fly-fishing schools while attending Auburn University. He is a certified instructor by the Federation of Fly Fishers and owner of the Emerald Coast Fly Fishing School. Jason understands the rigors of saltwater fly-fishing and knows how to position clients of all skill levels, for success. Captain Phillip Wilds was born and raised along the white sands of Panama City Beach, FL. Phillip was born into a family lineage of both commercial and charter fishermen dating back to the 1940’s. It would turn out to be Phillip’s calling to pursue this great family tradition, “It’s just in my blood” as Phil would say. At 31, Capt. Phil’s sport fishing career has taken him to every corner of the state, from Destin to the Glades and beyond. Capt. Phil’s 22′ Sea Pro’s versatility will accommodate both light tackle anglers and fly fishermen and still leave plenty of room for the family. “I thoroughly enjoy all types of fishing, but my true passion is light tackle”. Capt. Phil also cares for your little anglers as well, and he finds great fulfillment sharing his passion with young anglers. Seeing a little boy or girl holding a Bull Redfish screaming in excitement, “Look dad! It’s the biggest fish I’ve ever caught in my whole life!” That’s what it’s all about! Captain Jeff Ragland, like all of the guides at Shallow Water Expeditions, is passionate about his fishing – a passion of his since childhood. But Jeff’s first passion is taking other people fishing. “My greatest joy is when I’m on the back of the boat, not the front.” A Federation of Fly Fishers Certified Casting Instructor, he is also an instructor at the Orvis Fly Fishing School at Watercolor Resort. An experienced guide and teacher, Jeff’s real virtue is his patience and his genuine effort to make your time on the water rewarding and always fun. “You learn something new every time you’re on the water, and sharing that experience is where the real joy is!” No matter the age, youngest to the oldest, Capt. Jeff will make sure you feel at home on his boat and ultimately, at home on the water. Captain Andy Lee just loves to fish. He’s fished all over the place – Mexico, New Zealand, the Bahamas, Chile and the States. He spent the last decade guiding in Colorado, which cemented what Andy has always known – that he loves putting people on fish. He now lives down in the Everglades, where he can be found pursuing snook, redfish, and tarpon on fly. His laid back personality, coupled with his enthusiasm make it impossible not to enjoy what you’re doing out on the water. Andy’s main goal on the boat is to make sure that you are learning and having fun. Captain Clint Hood is an Auburn, Alabama native who grew up hunting and fishing the waters around Alabama, Mississippi and the Florida Panhandle. Fishing and Duckhunting are both obsessions for Clint, and from February to October he can befound along the gulf coast patterning the local fish. Come November to January, you can bet that he will be in a rice or bean field somewhere in the Mississippi Delta with a hot cup of coffee, good friends and a wet dog. “The only thing that rivals a group of pintails cupped up in the decoys is a tarpon screaming off drag.” Clint is an advocate of getting kids involved in the outdoors, donating his time to the Ducks Unlimited’s Greenwing program and the CCA Kids Tournament at Grayton Beach. Fishing the better half of his 27 years, he is experienced in all types of waters. Fishing year round, he witnesses the ever changing fish patterns. This allows him to know when and where the fish will be on the next trip. Captain Preston Sutter has been chasing fish for the better part of his life. Whether it was brook trout in the Appalachians or redfish and tarpon in the Gulf of Mexico, he believes everyone can learn something new from each day spent on the water. He is committed to constantly improving angler’s skill-sets while aboard his skiff, and making sure each one has a productive and exciting experience. Preston understands the challenges that many newcomers face when targeting saltwater species; his calm and patient demeanor allows anglers to relax and focus on the fish they pursue – a trait that helps anglers from all skill-levels further enjoy their day on the water. Brett Martina was born and raised in Apalachicola and has been exploring these local waters his whole life fishing and hunting. Brett started tarpon fishing when he was around 14 and has stayed on top of these fish ever since. He is very well respected in his community and some of his clients have nick-named him the mayor of apalach, which makes complete sense if you ever go to dinner with him around town. Not only can he offer you a wonderful experience on the water, but you can also gain a good friend and get to experience the true meaning of southern hospitality in his presence. Captain Cleve Evans grew up fishing the lakes, rivers, mountain streams, bays and beaches of the Southeast. He spent countless hours plying the waters from N. Georgia to the Gulf Coast in search of pretty much anything that swims. Equally as comfortable with spin tackle or fly, his passion for catching fish and sharing the rewards from that with others naturally grew into guiding. Having fished the waters around Mexico Beach and St Joe Bay for most of his life, he gets no better joy than to pass his knowledge along to whomever is on his boat. Whether it be a first time beginner or a seasoned skilled angler, he is eager to get on the water and create memories that will last a lifetime! Capt. Jack Foley was born and raised on the Choctawhatchee Bay in South Walton County,FL. He was drawn to the water even as a toddler, when he delighted in fishing, setting out crab traps and throwing a cast net off the dock at Eden State Park. Many have remarked that Jack’s love of fishing is in his genes. He is the namesake of his late uncle Jack, who was a commercial fisherman out of Panama City, while another uncle is a well known fly fisherman and outdoor writer in upstate New York. An accomplished surfer as well as an avid fisherman, Jack loves everything about the waters of the Florida Panhandle. When not guiding others, he spends most of his spare time running his East Cape Skiffs Vantage to explore any and all waters of nearby bays and beaches. Unless, of course, it is a visiting fly fisherman on the bow of his skiff watching that fish eat the fly! Captain Sean Cramer was born and raised in Dunedin, Florida where grand slams are an everyday thing. Capt. Sean started fishing around age 10 when his father started the john boat, pushed him off, and said “see you at sunset”. From that moment on, the addiction was real. Capt. Sean is still serving in the Air Force (17 yrs) and guides every moment he can. Sean fishes his 24 Skeeter out of the Destin area on the shallow reefs and natural bottoms. Growing up in central Pennsylvania, Steve comes from an avid outdoor family (his grandparents and parents fly fished)! He honed his skill fishing the area’s famous trout streams, the Susquehanna River and the lakes of the Pocono Mts as a kid. After graduating from Grove City College (Pa.) and a stint in the U.S. Army he landed a job on a charter boat in Cape May, N.J. That taste of the salt led him to Panama City Beach in 1980. Steve’s passion is sight fishing the bays and beaches of Bay and Gulf Counties with a fly rod. During the fall, winter and spring seasons he loves to explore the ultra skinny waters of the marshes and tidal creeks chasing redfish. If he can’t get there in 5 inches of water in his skiff be prepared to get wet and pursue on foot! The summer heat means tarpon on the beaches and Steve will be staked out in a lane in his 22′ 1972 restored Aquasport totally outfitted for the task! Steve has incredible patience and moves less than a lot of guides, “Working an area slowly is more likely to yield success with a flyrod. I believe fishing is more about quality than quantity”. Spin fishing is available too, artificials only! Capt. 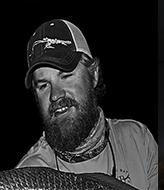 Steve has written the Gulf Coast Fishing Report for Flyfishing and Tying Journal, appeared in Salt water Flyfishing Magazine and been featured in numerous episodes of Chasin the Sun TV Show. © Shallow Water Expeditions 2016 : Santa Rosa Beach, FL 32459 •et; Design by Simple Solutions, Inc.